“The Seed Of Life shape is six circles or spheres that complete one full rotation around one circle or sphere. 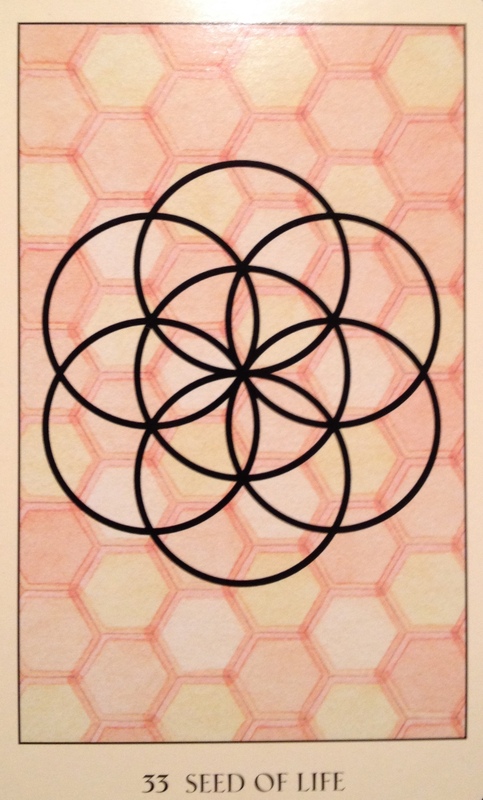 This geometric configuration forms a beautiful six-petaled flower. It is sometimes referred to as the Genesis pattern because the Book Of Genesis says that creation was formed in six days. The Seed of Life is a key to understanding the expansion of new energy, information, and light as it enters consciousness. Pulling this card marks the beginnings of change in the progression of your inquiry. You have left the security of the center, of home, of the known, and you are seeking a new way of looking at the world. In so doing you have begun a pilgrimage that will lead you to a greater understanding of who you really are. Your has become the path of a seeker. You are beginning an adventure that may become the passion that will fuel your life’s work. When we hear the word “change” we almost always look around us at our external world, wondering how that change will look. Will I lose my job? Change careers? Move homes? End or begin a relationship? What will the change bring? What form will it take? There is often an aspect of anxiety with the way that we approach change, as if it’s a wild animal that must be tamed or a new person that we are not sure can be trusted. We feel guarded, wary and even a bit on edge. Yet, this message is one of shifted perspective, the very root of change. It’s about the deep changes that start at the very core of our being, those that happen when we have finally let go of all the old belief systems, blockages and limitations and made space for the light. It it about lightening up, quite literally… vibrationally, physically, mentally. Body, mind and spirit. It is about stepping past old blocks with a smile and a deep knowing that things are different now, that anything really is possible. All that old stuff was just smoke and mirrors; it was never really holding you back. Only we can hold ourselves back. Only we can decide to move forward. It is about releasing the old and embracing the new, and what better day to do it but the very first day of a brand new year, full of possibility? In the seed of life lies everything that is, was and will be. Step forward to claim what is yours fearlessly; with peace and calm; grace and ease. Change is upon us, can you feel it?